Parkers Pound is a picturesque brick & flint thatched period cottage, Listed Grade II, and believed to date back from the mid-14th century. Originally two houses, the property is reported to have been built by a yeoman farmer in about 1350 with later additions in the mid-15th century. The accommodation has immense character with an Inglenook fireplace in the main sitting room and many exposed beams and timbers throughout the property including an attractive kitchen with herringbone brick flooring and a large open plan reception/sitting/dining area. On the ground floor there is also a separate reception room as well as a ground floor cloaks/bathroom. On the first floor, the master bedroom has an en-suite shower room. The second bedroom has an en-suite bathroom and there is a third bedroom off bedroom 2. Additionally the property has a detached self-contained annexe comprising of a sitting room with small kitchenette and a bedroom with en-suite shower room. Attached to this is a utility room and garage. 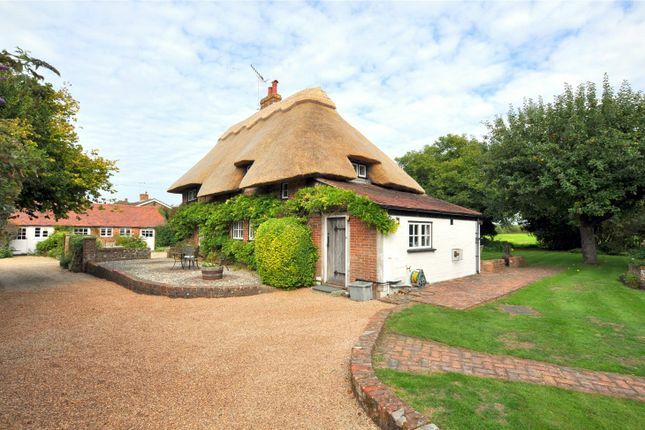 The property has recently been re-thatched in 2018. Parkers Pound has a gravelled driveway with ample parking with wrought iron gates leading to a gravel terrace and lawned gardens adjoining the annexe. Further areas of lawn wrap around the property with a paved terrace off the kitchen. Parkers Pound is located only one mile from Bosham foreshore and Sailing Club. The village has a picturesque High Street and ancient parish church. Bosham Sailing Club has the largest fleet of classic day boats in the country. There are a number of local shops in the old village centre together with the Anchor Bleu public house and a short walk along Bosham Lane brings the visitor to the Millstream Hotel and its popular restaurant and brasserie. About 1/2 a mile to the north lies Bosham Railway Station along with a further collection of local shops. The station provides a convenient railway halt with services to either Havant or Chichester which in turn provide regular services to London Waterloo or Victoria respectively. Other sailing clubs nearby are located at Itchenor, Dell Quay, Chichester Marina and Emsworth. 2 radiators, telephone point. Casement door to rear gardens. 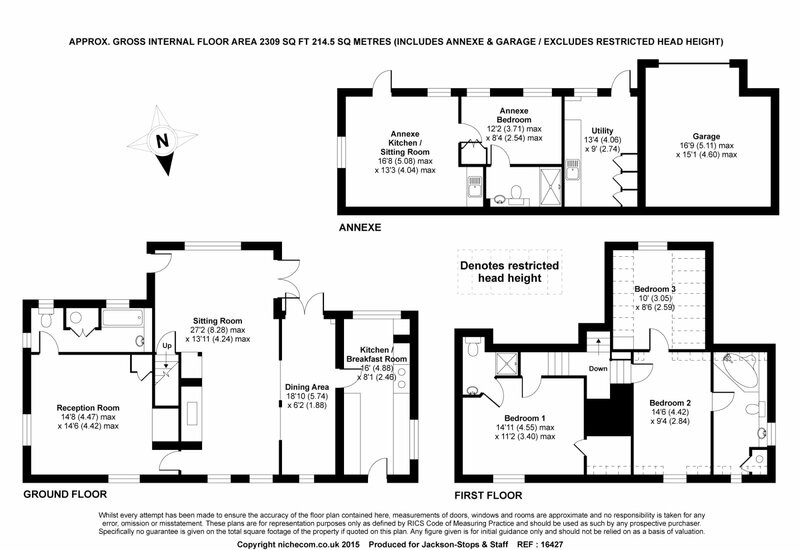 4.88m c 2.46m - Herringbone brick floor, double aspect room with views over the rear and side gardens. Door to front. The kitchen is equipped with a range of hand built kitchen units comprising of cupboards and drawers with additional spice and basket drawers. Polished marble worksurfaces incorporating single butlers sink and mixer tap, integrated dishwasher, 2-oven gas-fired Aga, dresser style unit with display shelves, integrated fridge and freezer, part tongue & groove painted ceiling. Inglenook fireplace with brick hearth and in-set (currently sealed). Television point, radiator, exposed wall and ceiling timbers. Wall light points. Tiled flooring, exposed wall timbers, pedestal hand basin, low level WC, panel bath with period-style mixer tap and hand shower attachment. Heated towel rail, wall light points, built-in airing cupboard housing lagged hot water tank, radiator. Access to loft, exposed wall timbers. Double aspect room. Range of fitted wardrobe cupboards plus a walk-in store/walk-in cupboard fitted with shelving. Wall light points, exposed wall timbers. Access to loft. Tiled flooring. Fully tiled walk-in shower cubicle, pedestal hand basin with storage cupboard below, tiled splash-back and downlighting. Low level WC, radiator. Exposed wall timbers and radiator. Tiled flooring and part-tiled walls, corner Duravit bath with chrome mixer tap. Duravit low level WC, hand basin with storage cupboard below. Downlighting, shaver point, corner cupboard housing lagged hot water tank, downlighting and extractor fan. Chrome heated towel rail. Access to loft. (at mid-skilling). This room is accessed off Bedroom 2. Radiator, views over rear garden and neighbouring farmland. (max) 13'10 x 13'5 (min). Painted brick and part-cladded walls. Downlighting, exposed ceiling timbers. Dimplex storage heater. Kitchenette recess with range of wall and flooor units, worksurfaces incorporating single stainless steel sink and drainer. Integrated fridge. Dimplex storage heater. Downlighting. Meter cupboard, built-in wardrobe cupboard. Access to loft. Tiled flooring, walk-in fully tiled shower cubicle with fitted rain shower, extractor fan. Downlighting, low level WC, hand basin with tiled surround and cupboard below. Fitted mirror, chrome heated towel rail. Parkers Pound is approached via remote controlled double wooden gates, leading to a large area of gravelled driveway and parking with double wrought iron gates leading through to a further area of parking adjacent to the annexe. Range of fitted wall and floor units, worksurfaces incorporating butlers sink and plumbing for washing machine. The gardens are a particular feature of the cottage and comprise of an attractive cobble-set ornamental area that runs alongside the front of the property. The rest of the gardens are laid out predominantly to lawn with a south-facing terrace approached by way of double doors from the dining and sitting room. The gardens have a number of well-established apple trees and herbaceous borders. A low brick wall and steps lead to a further area of lawned garden with a fish pond and further raised borders alongside the annexe. There are also two garden sheds and a further area of hard standing.